and intense research. Exide solar batteries are designed for efficient storing of energy and providing power optimally whenever required. These batteries withstand daily charge-discharge cycle, work even in partial state of charge condition and recharge fast. 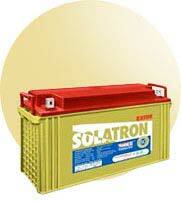 Exide solar batteries can also be customized to suit your various needs and budget. Key in the specifics and pick the right battery.